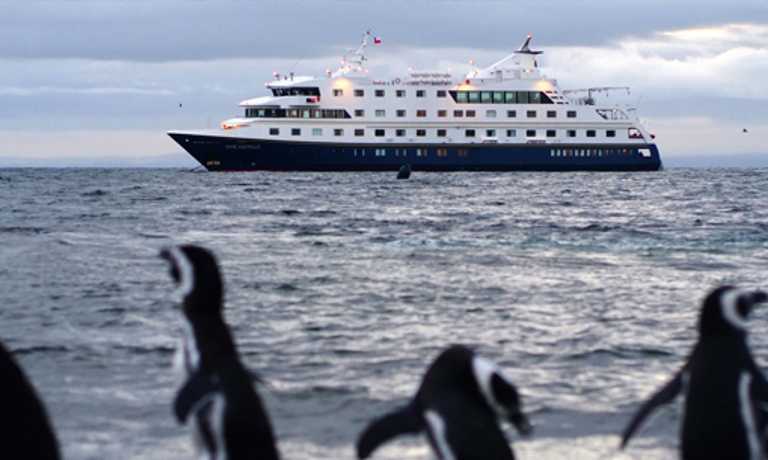 A more active way to see the varied wildlife, glaciers & landscapes of Tierra del Fuego, as well as setting foot on Cape Horn. 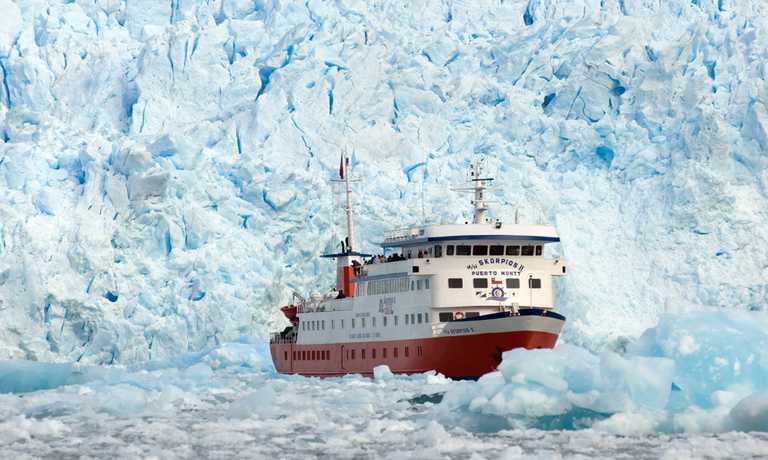 See penguins, elephant seals, a glacial waterfall, Magellan forests & a number of glaciers. Depart Argentina & land in Chile 5 days later. Check in between 1000 and 1700 at 160 Juan Manuel de Rosas Street. Board the cruise ship at 1800. After a welcoming cocktail reception hosted by the Captain and his crew, the ship will depart for one of the remotest parts of the planet. 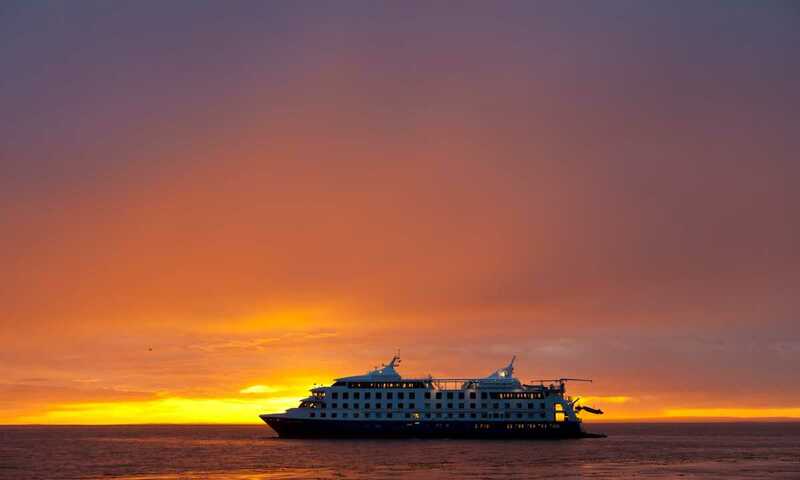 Our voyage will take us through the Strait of Magellan and Beagle Channel to explore one of the most breathtaking wilderness regions in the world: Southern Patagonia, which includes the Tierra del Fuego archipelago. We will be sailing through Murray Channel and Nassau Bay to reach Cape Horn National Park, where, weather permitting, we shall go ashore. The legendary Cape Horn was discovered in 1616 and is a sheer 425m (1,394ft) high rocky promontory. For many years it was an important navigation route between the Pacific and the Atlantic, and is referred to as the 'End of the Earth'. The park was declared a World Biosphere Reserve by UNESCO in 2005. In the afternoon, we will go ashore at historic Wulaia Bay, originally the site of one of the region's largest Yamana aboriginal settlements. Charles Darwin landed there in 1833 during his voyage on the HMS Beagle. This area is also renowned for the mesmerizing beauty of its vegetation and geography. We will take an enchanted walk through the Magellan Forest of lengas, canelos, ferns, and other endemic vegetation, to reach a panoramic viewpoint. We navigate along the Northwest arm of the Beagle Channel to reach Pia Fjord, where we disembark. We will then take a short hike to gain a panoramic view of the spectacular Pia Glacier, which extends from the mountaintops down to the sea. In the afternoon, we will enter Garibaldi Fjord where we will disembark for a hike through the forest up to a glacial waterfall to enjoy the spectacular views. For those who choose to stay onboard, our captain will point the bow towards the beautiful blue Garibaldi Glacier so that they can enjoy the panoramic view from the upper decks. In the morning, we will be sailing through Cockburn Channel to anchor in Chico Sound. Travelling in well-equipped Zodiac boats, we will explore Alakaluf Fjord and enjoy the view of Piloto and Nena Glaciers from the sea. You will find yourself being drawn to the intense blue colour of Piloto Glacier, which is due to its compression and age. We will learn about the formation of glaciers and their influence on the unexpected topography of the Fuegian-Patagonian channels. In the afternoon, we will enter the spectacular De Agostini Sound, right in the heart of the Darwin Mountain Range. This is the perfect viewing point to appreciate glaciers that make their way down to the sea from the upper ice field. Later that afternoon, we will travel aboard Zodiacs to the Aguila Glacier where we will embark upon an easy walk to its base. It's the perfect opportunity to experience the beauty of Patagonia's cold rainforest and to see how the power of nature has moulded the spectacular landscape. Early in the morning, weather permitting, we will go ashore on Magdalena Island, located in the middle of the Strait of Magellan. The island used to be an essential source of supplies for navigators and explorers and is inhabited by an immense colony of Magellanic penguins that we will be able to see during our walk to the lighthouse. Finally, disembarkation at Punta Arenas is scheduled for 1130. The Cape Horn landing was the highlight for me.....and all those steep stairs which I slowly made it up, despite having bronchitis. We also won the auction at the Captain's dinner for the navigational map of the Cape Horn landing... a thrill. I've already recommended this trip to family and neighbors! Prices quoted are in $ USD per person based on 2 people sharing. Availability changes all the time, please contact us for up to date details, and any cabins recently made available. Please note: Limited Availability, book soon to avoid disappointment! *Cape Horn Landing is subject to weather conditions. *In September & April, due to penguin migration, the Isla Magdalena Penguin Colony trip will be replaced by a Zodiac boat trip to the Sea Lion colony at Marta Island. Superior cabins ('S') are approx 25% larger. Single supplement & Solo travellers - the cruise operator does not have a willing to share policy. If you are a solo travellers or would like a single cabin, there is a 50% surcharge. Child policy - 3 to 12 year olds receive a 50% discount when sharing a cabin with an adult. Extra beds - it is possible to turn certain cabins into triple cabins; for availability and rates please contact us.